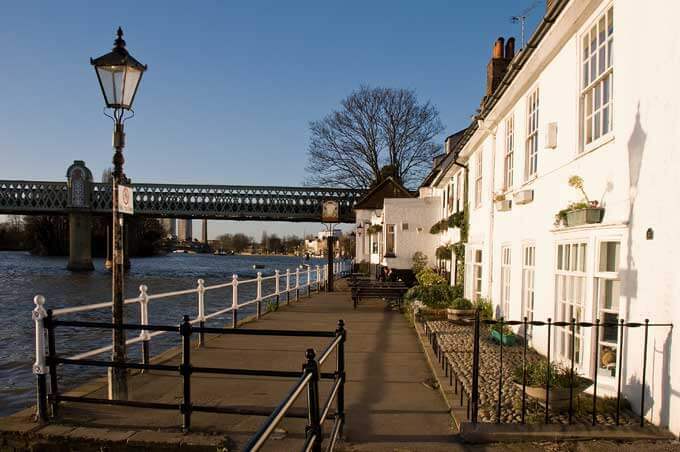 Covering an area of 2.20 square miles, Chiswick is a large suburb of West London that during the 1900s was a country retreat for well-off Londoners. Located mostly in the London Borough of Hounslow, the population of Chiswick increased significantly during the latter part of the 19th century when expanded building activity led to London suburbs merging with the capital. Chiswick High Road offers residents a decent mixture of well-known retail outlets including Waitrose, Marks and Spencer, Gap and WHSmith alongside a respectable choice of quality restaurants and pubs such as Bills, Byrons, Zizzis, Pizza Express and smaller independently owned restaurants. There are also hotels, B&Bs, and office accommodation in the suburb. Chiswick is furthermore home to the Griffin brewery where Fuller, Smith and Turner brew their prize winning ales. Chiswick has an ideal location, being well situated for the M4 and M25 motorway and the north circular. It also has two tube stations serving the District and Piccadilly lines. With a commute into Central London taking around 40 minutes, Chiswick is a popular location for families and individuals who want to be near the capital without the extortionate central London property prices. The average property price in Chiswick is £1,020,998, which may be expensive when compared to other parts of the UK, but is considerably cheaper than Chelsea for example, where the average property price is double at £2,043,215. The housing stock in Chiswick consists of a mixture of Georgian, Victorian and Edwardian properties, all perfect for loft conversions. Touchstone Lofts is based in Chiswick and we have done many Chiswick loft conversions. Why Choose Touchstone for Your Loft Conversion in Chiswick? Touchstone Lofts are a Which? Approved Trader with over 20 years’ experience in the loft conversion industry. We believe our experience and dedication to customer satisfaction is instrumental in setting us apart from other companies, and why we should be your first choice for any aspect of loft conversion work. We will take care of every part of your Chiswick loft conversion personally; no part of the work is ever outsourced to other contractors. This means you can be sure that you are getting the top quality service and work we are so well known for. In the district of Chiswick, planning permission is not usually required for a loft conversion. As experts in the field, we ensure that all building regulations are adhered to. We can complete most of the paperwork on your behalf which gives you less to worry about. No job is too big or too small for Touchstone Lofts and you will receive the same high level of service regardless of the size of your project. Contact us today for your free no obligation quotation. We also guarantee that you will never be charged for any hidden extras, so the price that you are quoted for your Chiswick loft conversion is the price that you will pay.